I wanted to start a new topic to describe some of the improvements I’ve made, or will be making to my World Cup Soccer 94 pinball machine. One thing I really think is cool about pinball collecting is that there are so many different modifications (“Mods”) that you can do to just about every machine. One of the most common mods that people do is to install LED lights into the machine. My first attempt at putting in LEDs led to a much improved backbox. I never really liked regular incandescent bulbs in pinball backboxes because they always made the art look orange. This wasn’t a major problem with the Jurassic Park pinball machine, since the art was mostly orange and red in color. However with WCS the art is primarily blue and green. Those colors look horrible backlit with warm white incandescent bulbs. I had the opportunity to go to a pinball show in Kalamazoo, MI called “Pinball at the Zoo”. I had a great time there playing different machines, but the most fun I had was looking at all the cool pinball parts available. It was there that I decided to try cool white LEDs for my backbox. I picked up a set and swapped out the bulbs in my WCS backbox. The difference was AMAZING! Here’s what I ended up with. Much better! Fast-forward to this fall and I’m ready to take the next step by replacing the rest of the bulbs in the machine with LEDs. This includes the inserts and the general illumination bulbs. I’ve been researching the best approach to making the switch and I finally decided to go with the WCS LED kit from Pinballbulbs.com. They are a new LED vendor and really have some exciting kits. 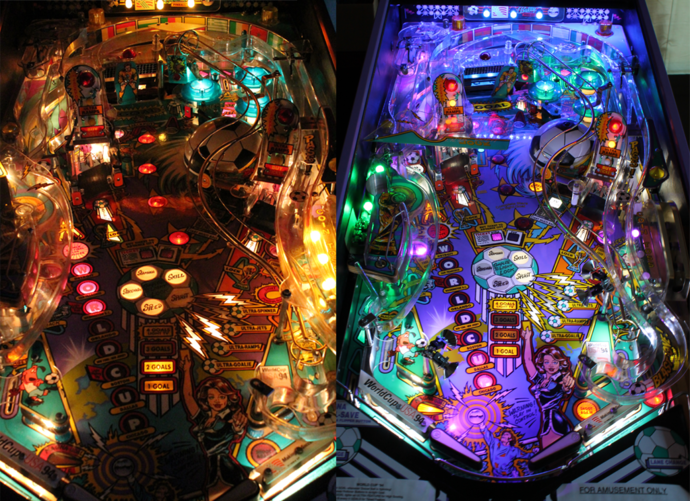 Not only do they include LED replacements, but they also have add-ons that can really help improve the overall lighting of the playfield. The WCS kit comes with two different kinds of add-ons. First, there are spotlight kits that actually add spotlights to the playfield to cover more of the open areas that can be dark in dark rooms. Second, there are both backbox and apron illumination kits that add LED “ribbons” to brighten up the dark ends of the playfield where GI lighting isn’t available. I purchased this kit and will be installing it over the next few weeks. I’ll have a full review once my installation is complete. What sold me on this kit was the following image. It looks amazing! Finally for this first post about my WCS improvements, I need to go back to something I did to the machine not long after I got it. One of the features that I like of some of the brand new pinball machines being released is the use of Powder Coating on the metal parts. Many of the new “Limited Edition” machines from Stern and Jersey Jack Pinball have very nice powder coated legs, side rails, hinges, and lockbars. I decided it would look great to do the same thing to my WCS, and really make it look nice. I have a friend who actually does his own powder coating in a private shop at his home, and he does amazing work. He’s done arcade parts for me in the past, like the legs on my Asteroids cocktail. I stared with a really cool metallic purple powder that was a perfect match for the darker purple tones on the playfield. However, when I received my parts and actually saw them in my basement, the purple turned pink under the incandescent lighting in my gameroom. It looked great in florescent lighting, but not so well in a full spectrum. I ended up totally changing powders to a more conventional solid purple powder. Although not as cool looking as the metallic candy purple, it ended up looking fantastic on my machine! Here are some color comparisons. First is what I was trying to achieve. The second is what it looked like under my basement lighting. The third is what I ended up changing to. I’m really pleased with how this turned out! I’ll be posting more updates very soon, and even submitting some full reviews of the products I purchased to really make this WCS look great!